Capital Transportation is recognized both as an industry leader and the transportation company of choice. Capital Transportation provides quality services and maintains the highest standards in safety and reliability. Capital Transportation, Inc. operates a results-oriented transportation service. 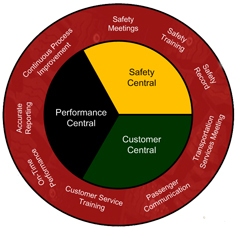 Three elements are central to our success: safety, customer satisfaction, and performance.